Info Kick off from the starting block and sprint along the 100-meter stretch to the finish line in as short a time as possible to win. Make sure you wait for the starting signal, as kicking off too early will result in a false start. Start: Swing down Wii Remote. Run: Shake Wii Remote and Nunchuk alternately. 100m is a track Athletics Event that appears in the Wii version of Mario & Sonic at the Olympic Games. It is set in the National Stadium. The aim of the event is to reach the finish line of the 100m track in the fastest time. Mario, Luigi, Peach, Bowser, Sonic, Tails, Knuckles and Dr. Eggman can be seen competing in this event in the opening, with Cream as the referee. The starting world record for the event is 9.77 seconds, and the starting Olympic record is 9.84 seconds. Toad, Shy Guy and Espio also appear as referees for this event in the game. This event starts by introducing each of the characters being played as and their lane number before showing them all ready to run from the blocks. When the word "Ready" appears on screen, the player must hold down to charge up energy, shown by a meter in the corner. When "Go" appears on screen, the player must release and swing down the Wii remote to start the race. Doing so with perfect timing will grant the player a starting boost, while doing so too early will result in a foul and the event being restarted. Once the player's character starts running, they should build up speed by shaking either the Nunchuk and Wii remote up and down if they are using both, or just the Wii remote if they are using the single control scheme. Doing so faster will make the character run faster. This event is a 100 meter race. To get a good time, you'll need good timing at the starting block, then fast speed on the track. This event uses the Wii Remote and Nunchuk. While "READY" is displayed, press to build up energy. When "GO!" appears, swing the Wii Remote down an release to start running. You can speed up by quickly alternating the Wii Remote and Nunchuk up and down. You can also play this event with only the Wii Remote. Shake the Wii Remote to speed up. Mario: Mario's sixth event is to beat Sonic in this event. Amy: Amy's third event is to win the event after performing a perfect start. Sonic: Sonic's sixth event is the same as Amy's third event, win after performing a perfect start. Shadow: Shadow's sixth event is the same as Mario's sixth event, in which he must beat Sonic. Mario and Sonic competing in 100m. 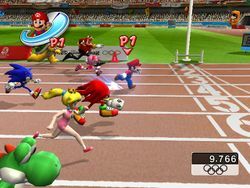 Dr. Eggman, Amy, Wario and Bowser competing in 100m. This page was last edited on February 4, 2019, at 03:18.